Project managers are no longer judged by the technical success of their projects alone. They're also held accountable for their contributions to the company's financial goals. Yet most project managers don't have the business knowledge necessary to make project-based decisions that lead to bottom-line success. 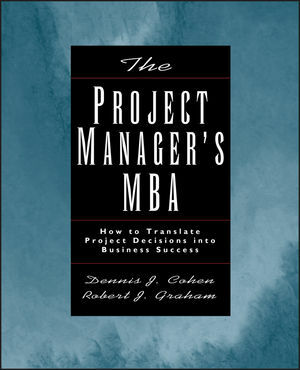 In this book, Dennis Cohen and Robert Graham, both former university professors and experienced project management consultants, provide the skills that, until now, could only be gained through a graduate degree and years of hands-on experience. Cohen and Graham's principles apply equally to projects in business, non-profit, and government organizations. And each one is illustrated through case studies drawn from a range of industries, including pharmaceuticals, the technology sector, even the winemaking business. Whether the mandate is to get new products to market, improve the infrastructure, or better serve customers and clients, this book teaches project managers how to make day-to-day decisions from an upper-management perspective. And it provides a blueprint for planning and pitching potential projects that demonstrates a higher level of business savvy. Dennis J. Cohen is senior vice president and managing director of the Project Management Practice at Strategic Management Group. Robert J. Graham has developed a consulting practice in project management and is the author of Project Management as if People Mattered and Creating an Environment for Successful Projects. Both Cohen and Graham have presented papers on this and other project management subjects at conferences of the Project Management Institute and Project World. "This book touches on issues that are critical to a project's success but are frequently ignored by project managers. I consider this a must-read for anyone who wants to manage projects effectively." --Judd Kuehn, senior project management consultant, Chevron USA Inc.